Ashtanga Yoga literally translates ‘the eight limbed yoga.’ While people typically think of yoga as movement and exercise, it is really a complete system of philosophy, movement, breathing, honing energy, meditating and finding bliss in the present moment, no matter what that moment may hold. While the asana, or movement, piece of yoga is the most visible piece, it is because the body is the easiest place to start to access out practice. Our practice starts with a philosophical base of ‘yamas’ and ‘niyamas’ which are mean ‘restraints’ and ‘observances.’ These practices include – non-violence, discerning truth, valuing what you have, balancing energy and fullness. non-grasping or coveting, purification, contentment, self-discipline, self-study and acknowledgment of things bigger than ourselves. Ram Dass’s guru Maharajji once said “It is a shame that no one practices yoga in the west any more.” Ram Dass told him that yoga was becoming very popular in the United States. That there were yoga centers all over the country and millions of people ‘doing yoga’ in these centers. Maharajji reminded Ram Dass that without the yamas and niyamas, restraints and practices, that movement was just movement, and it was not yoga. Yoga is not something we do, it is something we are. Like the drone that is behind all Indian Classical Music, the yamas and niyamas and other parts of our practice give us a compass. Like the drone, when we play, we are aware of the pitch, and the overtones of the drone tell us which notes we play are dissonant, and which ones are consonant. We certainly use a combination of dissonance and consonance to create interesting music, but, by knowing where the tonal center is, we know how to come from dissonance back into consonance and pitch and to stay in tune. Asana practice is the third branch. This is the classical movement. We start here, because the physical body is easiest to control. We can tell it what to do, and it starts to do it. We hone moving and new ways as our body opens, just as we can approach new situations and levels of understanding as our minds open. It is also believed, by some yogis, that our bodies act, in some ways, as an antenna of sorts, and that holding postures in different positions, that we can begin to understand different spiritual aspects. Other thoughts about our yoga asana practice is that it creates a situation where we put our bodies in stranger and more and more challenging contortions and postures, and then asks us to find stillness and calmness and meditation. So, like life, as we get into deeper and deeper challenges, these postures teach us to find places of peace and calm when we are scared, uncomfortable, unfamiliar, vulnerable, and so forth. This prepares us to take our practice from our mat to the world. After the postures, we study ‘pranayama’ – prana is considered both breath and life force energy. Yama means cessation or death. So, we can translate this both as ‘pran’ energy &’ayama’ aliveness or ‘prana’ breath’ & ‘yama’ cessation of. So, it is the act of slowing the breath and finding the energy behind it. Many yogis get to the point where they can cease to breathe for long periods of time, living, instead, off of the life-force energy that drives the breath. The next part of the practice is ‘pratyahara’ – or withdrawing from the senses into the spine or central channel. This central channel is the place where the chakras are. From there, we enter into dharana and dhyana. These are the processes of contemplation and concentration. While many people, mistakenly, think meditation is the process of ‘clearing the mind,’ this is only a small portion of the whole process. The Dalai Lama recently spoke of an acquaintance who had gone into a place of a clear mind for three years. The Dalai Lama noted that he was ‘a lot duller’ after these three years than he had been before hand. He then gave a description of the importance of processes of meditation that take one deeply into contemplation and deep analysis, down to the level of quarks and strings. He said that this was integral to our growth as individuals and as a species. So, meditation has all the elements of the microcosm and macrocosm. That there is the process of clearing the mind to connect with the divine, but also to understand the wonders and miracles of all the minutia around us. The process of meditation is not a method of escape. Instead, it is the process of becoming deeply in touch and engaged with everything around us. It is not losing awareness, but becoming hyper-aware. It is paying attention to everything and seeing everything, no matter how challenging, as purposeful. When we find this state of oneness, that we know as Samadhi. Many people say that Samadhi is unattainable. That it is something only for the great gurus, or something that we will never have access to, so give up. We believe and teach that Samadhi is a natural state of being. As The Ultimate Bliss, this is the place of miracles. A Course in Miracles teaches us that ‘there is no order of magnitude in miracles’ – that small miracles and big miracles are the same. It teaches us to expect miracles and to create miracles, and that doing so puts us in a paradigm where we understand that all things are miracles. This is samadhi. This is the place of bewilderment, of wonder, of pure love. This is a state attainable in a war zone and in sharing a moment with a loved-one. The processes of contemplation, concentration and samadhi together are known as ‘Samyama.’ That is the name of our coaching program, where we help people find this state of ultimate bliss. Because, like all things yoga, it is practice. Yoga is a spiritual practice that is akin to an empty vessel. It is a technology of practice that will bring one to higher states of knowing and of consciousness that fit any or no religious tradition. The Christian, the agnostic, the atheist, the pagan, the Hindu, the Muslim can all increase their feeling of connection to spirit and not have to compromise any part of their own spiritual or religious tradition. The word yoga means ‘union,’ or, more precisely, ‘alignment.’ A lot of people write this off as ‘union with God” – which, maybe it is, but there is much more of a technological answer than this. The yogis teach that we have five bodies, each one more subtle. And there is some evidence of this, as scientists can measure an energy field beyond the limits of the physical body. As in asana practice, we start with the physical body. This is dense and easy to control. The next subtle body is the mental body. As we know, this is a fleeting one. The mind is a wanderer, so, through meditation, we learn to focus and control the mind. We give the mind jobs to keep it centered. The next body is the ‘prana’ or energy body. This is a great one, as it is an infinite source of energy. We have all had the experience of feeling exhausted, but then, something life-affirming happens, and we, suddenly, have all the energy we need. This is when these bodies come into alignment. The next subtle body is the etheric body. A lot of people try to talk about what etheric is and how to control it. We know it can be a place where people can manifest many things. In general, I like to think of it as a transitional place between ‘prakriti’ – or that which is known and can be perceived; and ‘purusha’ – or that which in unknowable. The final body is where we touch the unknowable. Called ‘the bliss body,’ this is a place where, when we connect to it, we feel bliss. This is the state of revelation, of deep awe, of tapping into the source of all things. It is beyond definition, but when we tap into it, we know. While a lot of people try to look for the edges of all these bodies, the yogis know that that is the wrong direction. So, instead, we stop looking outward and look inward. This is ‘renunciation.’We make a u-turn in our pursuits, and find that all things align in the center. Specifically, we believe this happens along the spine, or the central channel. That here, all the spines of all these bodies connect. And when we align them and can access all these bodies, we have used yoga to find the state of samadhi. As a practitioner and teacher of Ashtanga Yoga, I invite you to explore these practices. 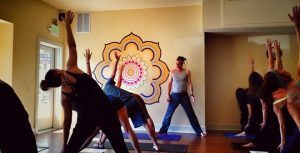 We offer classes and coaching through Evergreen Ashtanga Yoga . © 2019 BallFlutes - Richard Ball. All Rights Reserved.